Most runners have heard of the Peachtree Road Race – the world’s largest 10K held each July 4th on the hot, humid hills of Atlanta, Georgia. It has become an annual tradition for me to run it and this year was no different. 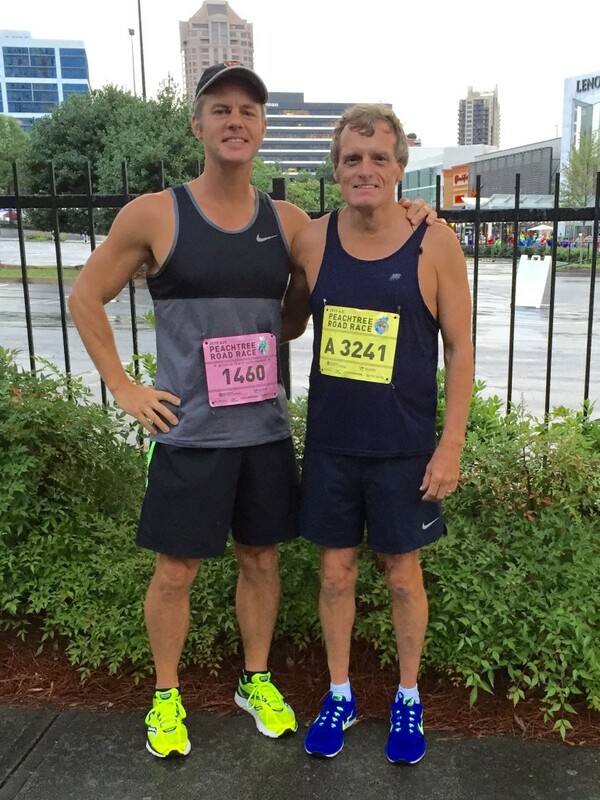 Except for a small break due to military service, I have run the Peachtree Road Race almost every year since 1982. Over that time, I’ve run the race as an awkward teenage boy, young adult, adult, and now as a middle-aged man. The race has grown in size each year, but for the past few years it’s stabilized in size with 60,000 runners. My fastest Peachtree was 38:07 back in 2002. Back in the 90’s I did the race with my extended family and it took us almost 2 hours to negotiate the course. A few years ago when I ran it with my wife and daughters, we finished it in about an hour and a half. Most years when I run it by myself, my finishing time has hovered somewhere between 40-45 minutes. 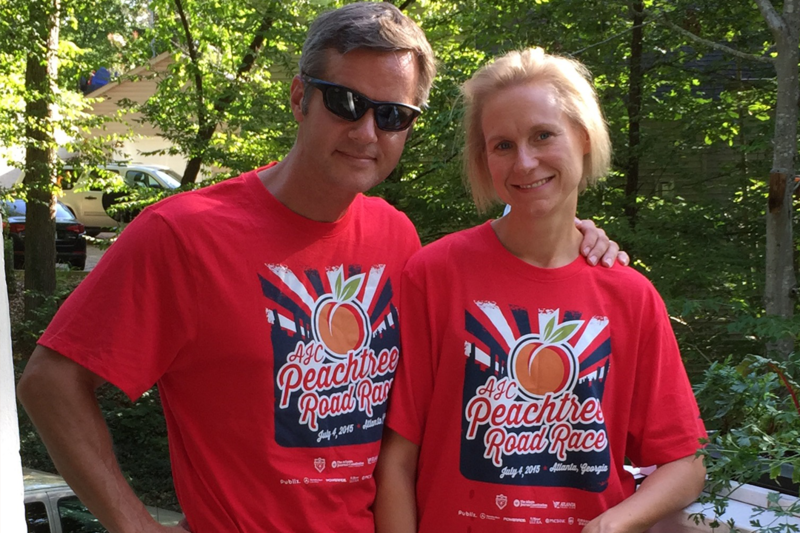 Both Mary Catherine and I ran the Peachtree this year, but decided to run it individually. 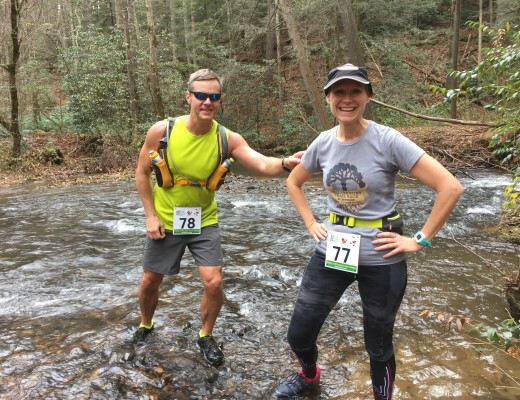 Pro tip – if you’re a running couple like us, be sure to agree ahead of time whether you’re going to run together or separately and stick to that plan. 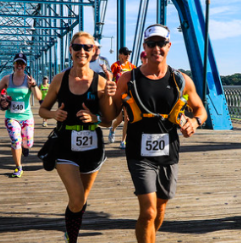 Don’t make your slower spouse feel guilty by “giving up” your PR to run together if you’re the faster runner. 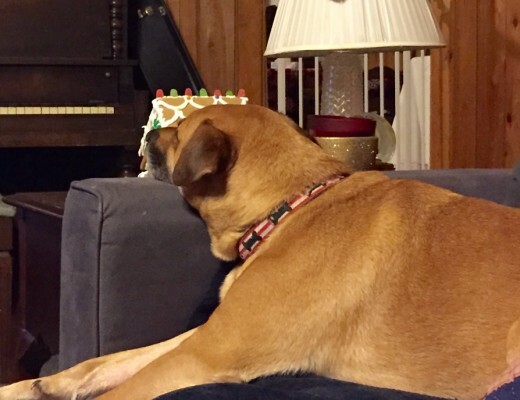 By the same token, don’t make your faster spouse feel guilty for wanting to push the pace. Whether Mrs. D & I run together or separately, we still enjoy the race. The day started early at 5:00am by meeting with fellow members of the Peachtree City Running Club to ride our chartered bus to the starting line. There was a light drizzle when we boarded the bus. 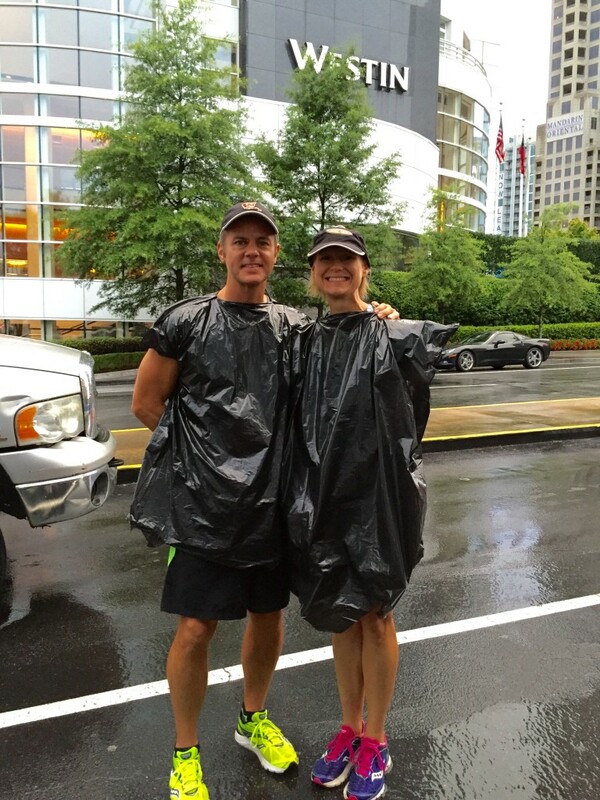 During the ride up to Atlanta, the rain began to increase in intensity but tapered off by the time we arrived at Lenox Square. 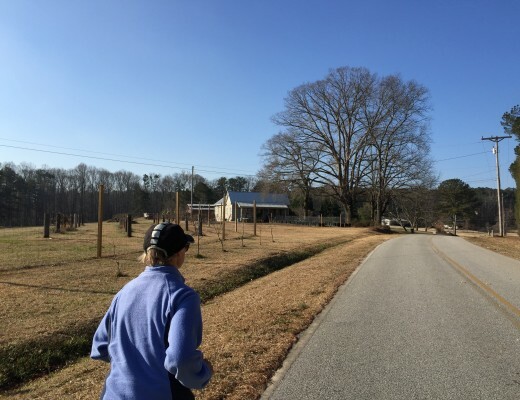 Slightly cooler temperatures and gentle breezes gave the appearance of great running weather. Little did we know about the oncoming deluge. We were prepared, though. Both Mary Catherine and I had run qualifying races earlier in the year, so I go to run up front in the sub-seeded runner section and she ran in Time Group C (the groups went all the way up to Time Group T in 2015). After a brief picture of us wearing our “trashy” rain gear and a quick kiss, we moved on to our respective starting areas. I was pleased to meet up with one of my running mentors, Mr. Bill Brackin, who races just as fast as me – even though he’s 20 years older! The rain held off and the starting gun fired promptly at 7:30am. I had a quick and fun jaunt down Peachtree. As usual, I ran the first 5K too fast (it’s mostly downhill) and suffered the final 5K (mostly uphill) with a short and steep downhill finish at Piedmont Park. It was only sprinkling by the time I got to the finish but the clouds to the north looked really dark. This year I ran nearly the same time as last year, finishing in a respectable 42:31. 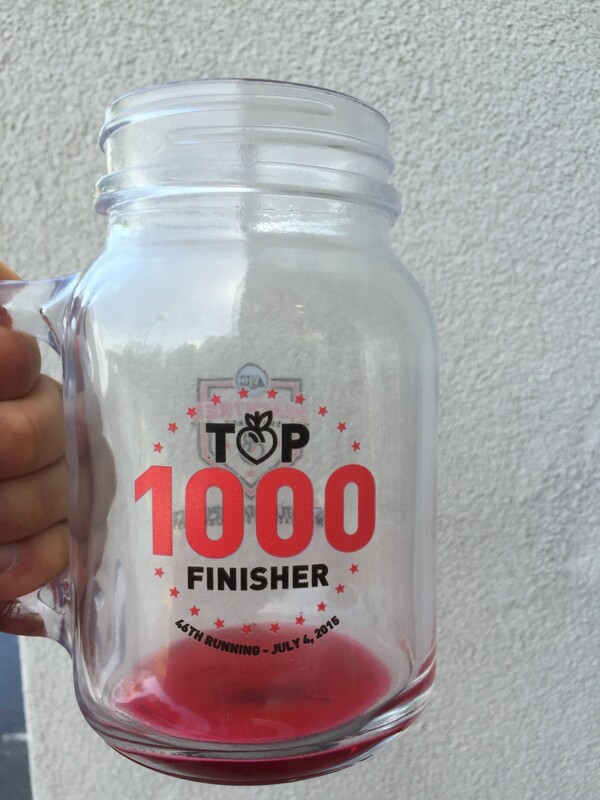 That was good enough to place in the Top 1,000 overall and earning me another Top Finisher Mug! When I run the race by myself, it’s always my goal to earn the mug. It gets harder and harder to do that each year as there’s no adjustment for age or gender – it’s just the first 1,000 across the finish who get the mug. I hung around the Peachtree City Running Club tent and waited for Mrs. D to finish, which she did in a fast 55:04 The race did accompany her final miles into the park and it only got worse. For those of you familiar with Piedmont Park, it’s no place to be when it rains as it sits in one of the lowest points in Atlanta. The park quickly became a mud bowl. Mary Catherine waited out the race on our chartered buses, while I hung out in the Atlanta Track Club member’s only park at the Park Tavern. While waiting, an announcement was made that the race was suspended due to lightning at the start! That has never happened in the history of the race. Eventually, Mary Catherine texted me that most of the running club had finished and were back on the bus, so I braved the rain and squished myself back onto the bus with the rest of our tired and wet running friends. Another successful Peachtree Road Race in the books! It’s a must do race.